AffluenceIQ is the only Database profiling the 2,000 richest people in Massachusetts. 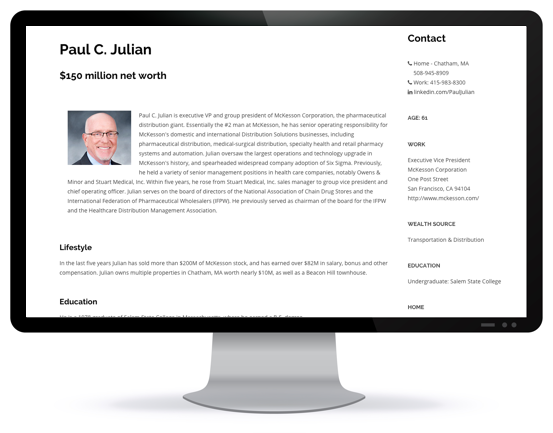 AIQ unveils the lifestyles, net worths, and influence of Massachusetts' wealthiest individuals: C-Level Executives, Venture Capitalists, Real Estate Moguls, Hedge Fund Managers, Celebrities, Physicians, Boston Brahmins, Athletes and more. How does AIQ determine the net worth estimate? Unlike Forbes Magazine, which attempts to deliver a precise net worth number, AffluenceIQ estimates are minimum net worth thresholds. What this means, is that we are not making any claim to knowing the precise wealth of any individual, but rather establishing a number we feel the individual is minimally worth. This means we feel very comforatable stating that the individual is worth at least x amount. This is especially true of individuals who do not work at publicly-traded companies, and there is often no public information on their salaries and stock holdings. How does AIQ develop the profiles? AffluenceIQ is the product of five years of methodical research. Each profile was individually developed by professional researchers and editors. None of the biographies were created via scraping or auto-generated web crawling. All of the information came from publicly-available sources such as SEC filings, Corporate filings, Court documents, and Newspaper & Magazine articles. References are listed for each profile. When were the profiles created, and how often are they updated? All of the profiles were created within the last 12 months. They are updated at least once a year, and there are new profiles added each week. Where does information on spouses and children come from? All of the information on spouses and children was developed from public sources. Names of children were only published if we found a publicly available news article which named the children. How does AIQ determine home values? Home values were principally derived from Assessors' databases. We typically utilized the assessed value, or if there was a recent purchase, the publicly listed purchase price. How are the images of homes and individuals obtained? None of the images of homes or individuals are hosted on servers operated by AffluenceIQ. Much as images are displayed when one performs a search at Google Images, the images we display are merely links to images available elsewhere on the web. Who qualifies to be in the Database? All individuals who appear in the appear Database must have net worths of $10M or more. They must also have at least one residence in Massachusetts. Executives of companies located in Massachusetts, who do not maintain a residence in the state, are excluded. We typically do not include folks who primarily live in other parts of the country, but maintain vacation homes in Massachusetts. This last parameter was bent if the person lived primarily elsewhere, vacationed in Massachusetts, but had strong roots in the area. John Grayken, a Cohasset, MA native who is an Irish citizen, is a perfect example of this type of inclusion. How did AIQ determine net worth when the individual owns a privately-held business? We generally valued privately-held businesses at a very conservative .25 to 1x sales. High margin businesses such as software typically received a 1x sales valuation. Low margin businesses such as distribution or construction were valued closer to .25x sales. We then extrapolated net worth figures from the business valuation, plus other information, including home valuations. For Investment Advisories, Venture Capital firms and Hedge Funds we analyzed total assets under management and publicly available IRR figures. If you are looking for customized research; are a subscriber and need help using the product; or have any additional questions, please contact us at 877-424-6695, and press Option 2. You can also email us at info@AffluenceIQ.com.